As fascinating and bizarre as Scientology itself, My Scientology Movie is unique among documentaries for its individual, humorous approach to a very strange subject. The Church of Scientology has become the big bad of documentary filmmakers. Last year brought us Going Clear, a movie that delved into the bizarre history of Scientology and the strange, terrifying figure of its current leader David Miscavige. This year brought us a book by former Scientologist and actress Leah Remini, reigniting interest in the notoriously secretive and notoriously litigious group. Now, My Scientology Movie, from British journalist Louis Theroux and director John Dower, takes us ever deeper into the weird world of Scientology and the people that…make movies about Scientology. As the title suggests, My Scientology Movie takes a novel approach. Rather than making a straight documentary, Theroux and Dower take their inspiration from Scientology’s love of big, lavish productions and decide to produce huge re-enactments of alleged abusive events. After being turned down for interviews by everyone within the Church, Theroux brings in the most famous Scientologist defector ever: former Church official Marty Rathbun, whose position as the Church’s enforcer was turned on its head when he was condemned by David Miscavige. This caused Rathbun to blow, leaving the Church and becoming its loudest and most aggressive opponent. Theroux and his team begin the process of “casting” their film, looking for young actors to play Miscavige, Tom Cruise, and fellow Church members, with Rathbun standing by and commenting. One of the most shocking and fascinating sequences has Rathbun leading the newly hired young cast through a Scientology training session – a bizarre exercise that takes principles of meditation and adds in militaristic self-control and exertion of personal will. It’s like combining watered-down teachings of the Maharishi Mahesh Yogi with Catholic ritual and tossing them into a Nietzschean blender. The sheer weirdness reaches its height, however, when Theroux begins to suspect – and then confirms – that Scientologists with cameras are following him around. After the team tries to film on the road outside one of the main Scientology compounds where much of the alleged abuse took place, they’re approached by prominent Church members who try to force them to leave, claiming that Scientology literally owns the road. Further developments occur as members of the Church hound Rathbun, accusing him of being an “SP” (Scientology-speak for “suppressive person”). Meanwhile, the production begins receiving weird, vaguely threatening letters from the Church’s lawyers. The overlay of a Hollywood production allows for greater truths to come to the fore as the film embeds another film within itself, allowing its subjects to become performers. This creates a sense of organic development, rather than a presentation of a preconceived hypothesis about Scientology or its adherents. Louis Theroux maintains his friendly, ingenuous persona, drawing out Rathbun with questions about faith, his reasons behind “blowing” from the Church, and his own culpability as a high Church official that used to threaten and beat up “SPs” viewed as undermining to the Church or Miscavige (usually seen as one and the same). It is Theroux, in fact, who makes this film such a joy to watch. He approaches Scientology with genuine desire to understand it, a fact that allows the events to unfold independent of his influence. He’s a likable screen presence who asks deceptively friendly questions with humor and understanding that allow the subject – here usually Rathbun – to reveal more and more about themselves. He also maintains his cool even in the most intense moments, and backs off when things get too heated. The results are electrifying, especially in his rapport with Rathbun, who becomes a more complex and questionable figure than in his other public appearances. 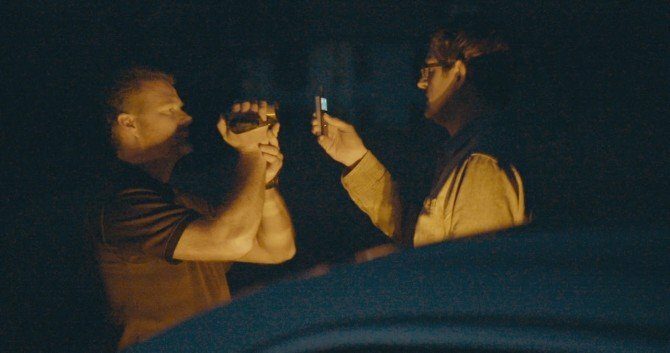 My Scientology Movie seeks more to understand Scientology, its inner workings, and what its members are searching for than it does to “catch” Scientology out. Theroux’s gentle, non-judgmental style means that the subject more or less gets to speak for itself, whenever it cares to speak. And, that the Church of Scientology obviously views Theroux, Rathbun, and everyone involved in the production as dangerous and “suppressive” people who should be threatened and hounded, says a lot more about Scientology than anything else could.